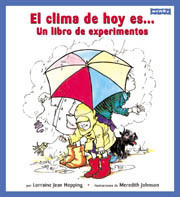 TODAY'S WEATHER IS... is available in Spanish! Q. How often do chemistry teachers tell jokes? Q. Why did the chemistry teacher stop telling jokes? A. There was no reaction. A. The teacher said it was a piece of cake. 1. What shower never gets you wet? 2. What is born in the winter and dies in the spring? 3. What exists only when it's moving? 4. What goes up when rain comes down? 5. What makes money fall from the sky? 6. What breaks but never falls? What falls but never breaks? 1. A meteor shower. 2. An icicle. 3. The wind. 4. An umbrella. 5. A change in the weather. 6. Day and night. 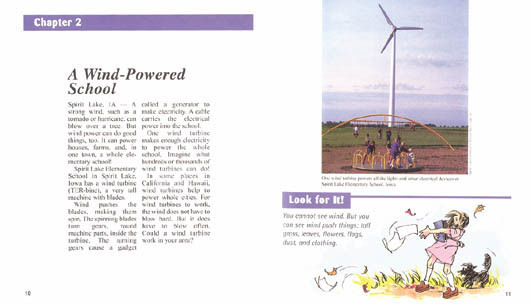 How can an entire elementary school run on wind power? Why are big cities "heat islands" that change local climate to make it warmer? How can a desert people turn fog into drinking water? 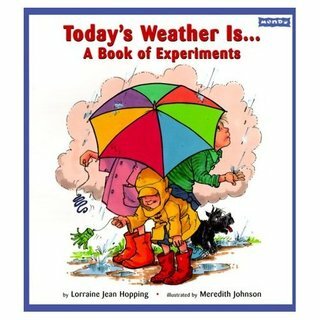 These and other short science news articles lead young readers to experiment with weather. This title is available in classroom sets of 6, in a big book format, and a Spanish language edition at Mondo, the publisher.